There should be some sort of law that says “If there’s blazing sunshine when you open the curtains of your B&B room, then you’ll be walking in heavy cloud when you leave an hour later.” Henfield’s Law sounds as good as any name, I’m sure you’ll agree. I had been affected by Henfield’s Law. That glorious view I’d seen out of the window had been replaced by a sea of grey. And it was even trying to rain as I made my way up the road towards the old railway line. Sited half a mile out of the village centre, Henfield’s railway station clearly hadn’t been conveniently sited for the residents. Not that it mattered now. Like most of the old railway stations on the Stenning Line, Henfield train station has long gone, buried under housing on a new road rather cheekily named “Beechings”. One public transport link does remain near the old station site; as I walked by I spotted five buses sat parked up at Henfield’s tiny bus depot, none of which seemed in a hurry to go anywhere on a Sunday morning. 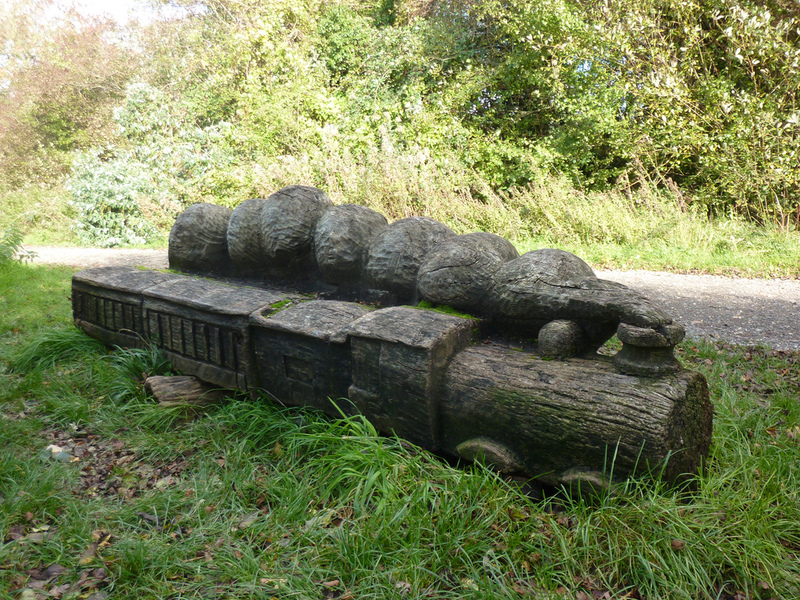 The old railway track – and the Downs Link – were hidden away a little down the road and soon I was strolling along a path strewn with fallen leaves and apples. The grey sky and rain hadn’t lasted long either and now the morning sun was streaming through the trees which lined the track. It was going to be an easy day. I had just nine miles to walk to reach Shoreham-by-Sea and I did my best to dawdle and enjoy the good weather as I mingled my way along past the many dog walkers that filled the path. Through the trees the hills of the South Downs stood, outlined in the sun and I couldn’t help but remember past adventures; of climbing up Truleigh Hill, topped with its radio and TV transmitters, and watching handgliders swoop and glide nearby. No hills to climb on Downs Link. Railways tended to avoid them. Something to do with the gradients. But that was alright because there was a wide valley between the hills which the railway had headed down. On its way it passed over the River Adur, and I pulled myself off the old trackbed and headed down the meandering riverside path. My reasoning was simple. Unlike much of the route, much of the railway line had been redeveloped. As such the Downs Link had been directed off down a number of roads until it reached the village of Steyning. 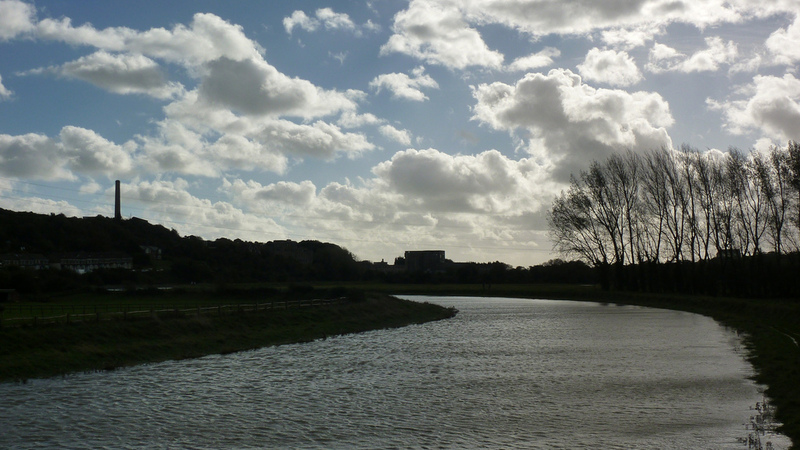 This decision made sense for those on bike or horse – Downs Link is a bridleway after all – but for the walker it was less appealing and so the decision to head down the lush green path next to the Adur was an absolute no brainer. 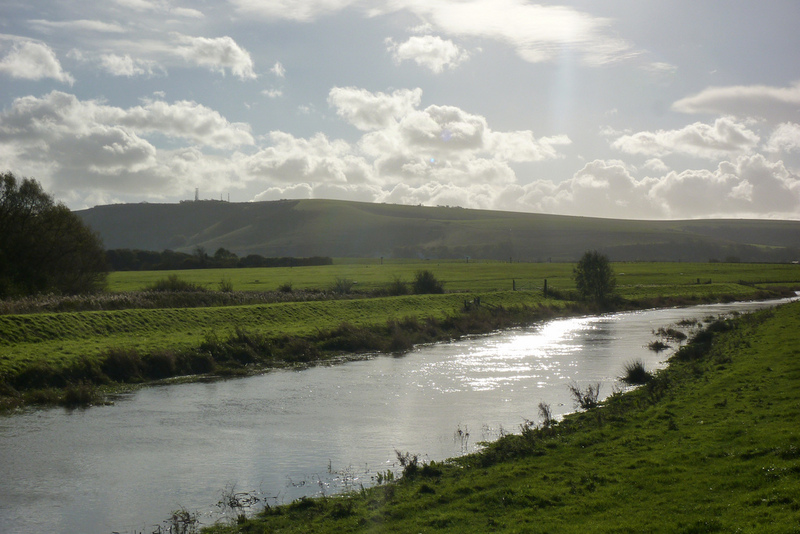 I followed the river down a few miles to a bridge that marked the boundary between the villages of Bramber and Upper Beeding – the latter on the east of the river, the former on the west. 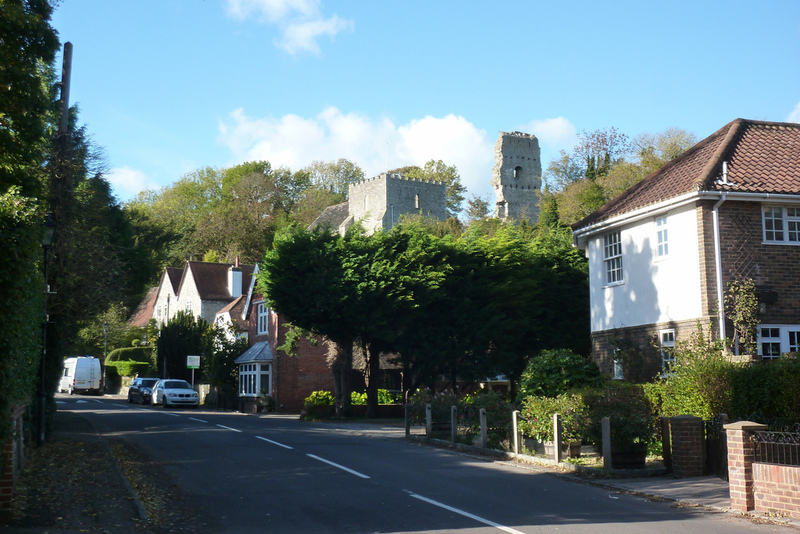 Over the years the two villages, and neighbouring Steyning have pretty much merged into one, yet each remains officially distinct. I could have followed the river further down and re-met the official Downs Link at a few miles on at the hamlet of Boltophs, but it didn’t seem right and I headed off into Bramber, home of a Norman-era castle. Most of the castle has long gone, but one wall remains; a giant lump of masonry looming up high above the village. On the other side of Bramber, I picked up the Downs Link once more. The old trackbed had been an early casualty of redevelopment. Barely had the last train pulled out of the station, and the line had been ripped up, covered in tarmac and re-opened as the Steyning By-Pass. So it was that the Downs Link trail found itself on a narrow pavement besides a busy main road. The road roared noisily as the Downs Link finally pulled away and headed towards the river again, finally reconnecting a mile or so outside of Upper Beeding. And it was here the link that gave Downs Link its name, was made. There, right in front of me, was the South Downs Way. From North Downs to South Downs I’d walked. The connection was made. And there was even a handily sited bench on which to sit and celebrate this momentous moment. Unlike Downs Link’s northern end, the trail’s southern terminus isn’t at a random location outside a village, and a signpost informed me I had another three miles to go to the ending at Shoreham-by-Sea. Although given I’d been told the same by another fingerpost three quarters of a mile earlier, it was hard to know for sure. As the South Downs Way headed off for the transmitters and paragliders , my path led me to the sea. The old railway trackbed was picked up again outside the former Shoreham Cement Works, whose derelict concrete buildings still tower over the area. For decades chalk was quarried on the site, converted into up to 250,000 tons of cement a year at one point, until the site was finally closed in 1991. Whilst the smashed windows of the buildings suggested the old works were long abandoned, the land around the works is still in active use and the path skirted the edge of the site, providing views of green and yellow buses, and the decaying remains of a host of static caravans. There was even the odd bit of railway track left in situ; most of the Steyning Line had closed in the 1960s but the cement works had meant a small stub remained in operation until 1981. 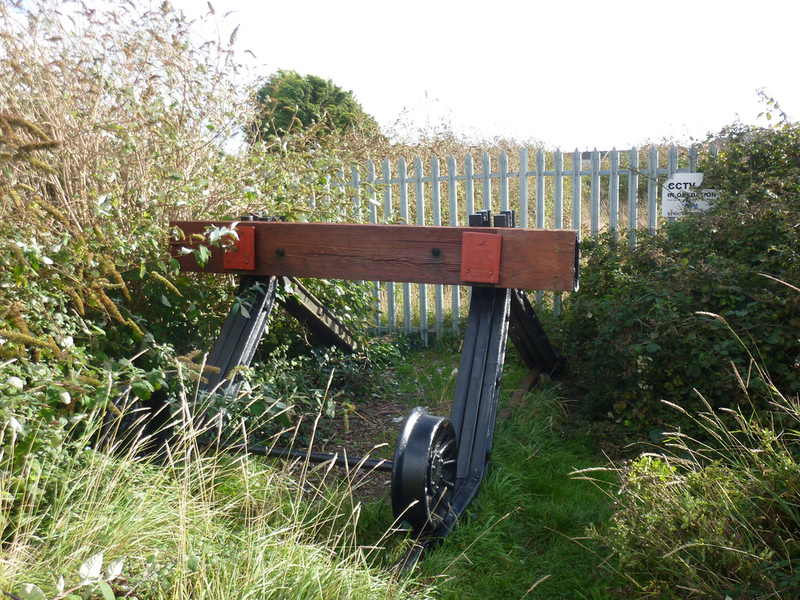 Alongside the works was what had caused that remaining track to be lifted. A busy, bustling road. Why transport your cement by British Rail when a diesel lorry can do it for you? The works was, after all, just a short way from the elevated dual carriage way of the A27. I passed under one of the busiest trunk roads in the country, taking in the concrete snaking mixture of slip roads circling around overhead. Cyclists zoomed by and Sunday dog walkers stretched their legs as I reached a rickety looking structure which now crossed the Adur. The 18th century Old Tollbridge was the first bridge to cross the river at Shoreham-by-Sea, and was built in the 18th century. Slightly oddly, despite being a road bridge, it had ended up in the ownership of the railways, and was operated by British Rail until the A27 was re-routed in 1970, meaning that the last tollbridge in Sussex was finally closed. With no lorries, cement trucks or double decker buses crossing it any more, the bridge is now a bridleway, taking people from the town towards Shoreham Airport on the other side. A simple wooden sign next to the bridge told me that the North Downs Way was now 37½ miles away, meaning my walk was over. The sea, the town and the very open South Coast railway line was somewhere ahead of me, but a set of buffer stops poignantly made clear that I wouldn’t be taking the old track bed to get there. I assumed that, being on the edge of town, that it had all been levelled and built on but back at home, pouring over satellite photos of the area, it was clear that it hadn’t. That it was all still there, just hidden away behind fences and barriers. Like most of the Steyning and Cranleigh lines, it had somehow survived. And maybe one day it would too would join the rest of the trackbed and be re-opened. Although that seemed as likely as trains running once more from Brighton to Henfield. Maybe one day trains will run on parts of the Downs Link once again. Perhaps the campaigners would finally win the battle and see Cranleigh connected up to the railway line, modern trains transporting commuters to Guildford or perhaps London, briefcases in hand. The car may have won the battle in the 1960s, but that had brought it owns problems. Railways were no longer being seen as hopelessly old fashioned, but part of the solution for tackling congestion and pollution. But they’re not there yet. With Downs Link the old railway lines play to a different tune. The slower pace of cyclists, horse riders and walkers. As I stood at journeys end, it struck me that there was something vaguely depressing about old railway lines. The ghosts of the steam trains hooting and pushing their way through the landscape, steam billowing out of the funnel, seemed to haunt Downs Link. At least for me anyway. And with that I headed off to Shoreham railway station. I had a train to catch. First Published: 26 February 2014. Last Updated: 16 November 2014.